No fewer than six children between the ages of three and 10 have been rescued from a suspected human trafficking transit camp in the Ejigbo area of Lagos State. The owner of the camp, 25-year-old Comfort Anwana, was arrested on Tuesday during a raid carried out by operatives of the state police command and the Ministry of Youths and Social Services. Her siblings, Gift, 28; and 23-year-old Blessing, who stayed with her, were also apprehended. They all hail from the Oron Local Government Area, Akwa Ibom State. the team stormed the one-room apartment camp following a report from some residents of the area that Anwana illegally took custody of the children. The state Commissioner of Police, Edgal Imohimi, who led the operation, noted that the camp was not an orphanage. He said how Anwana came about the children was shrouded in mystery, adding that the command would carry out an investigation to unravel the actual activities of the centre. 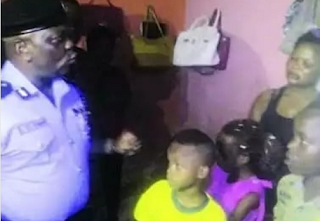 The CP, who said the arrest was the result of community policing in Lagos State, directed policemen at the Gender Unit of the command to work with officials of the Ministry of Youths and Social Development to ensure that the children were taken to a home pending the outcome of the investigation. However, Anwana, said the children were her nephews and nieces, adding that their fathers were dead.